“Yawp,” “mudluscious,” “lullly, lullay!” Modern poets broke all rules as they infused their work with everything new: invented words, imagism, concrete poetry, free verse, irony, oxymora held together with steely differences, and their individual eccentricities. The poets of this era both stunned and pleased the literati and critics. Whatever their “modern” period is called in the future, its brilliance cannot be denied, and Kenneth Patchen’s work, an example of poetic freedom, will remain timeless. Students of modern poetry well know the names of some of the founders of modern verse: Whitman, Dickinson, William Carlos Williams, HD, Wallace Stevens, e e cummings et al. Mr. Patchen is less familiar, perhaps, but he may have had a stronger influence on American poetry than some of the more famous writers, most of whom were Mr. Patchen’s acquaintances or friends. 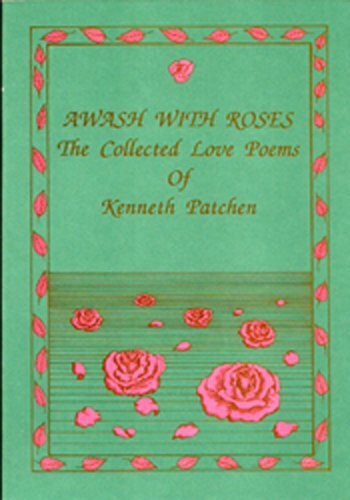 Although Mr. Patchen, an outspoken pacifist, is famous for his vivid and tragic anti-war poetry, his remarkable love poems may be more important; and Awash with Roses: The Collected Love Poems of Kenneth Patchen is now available once again. The reissue of his love poems testifies to his talents and perhaps meets the current need to cherish the beauty of life, love, and mankind. . . . Today, with political and economic unrest, with individual expression suppressed in many parts of the world, humankind yearns for a soothing of souls. Mr. Patchen fervently loves both the individual and the integrity of man, and the importance and meaning of ordinary objects, always positive, enlightening and touching. The modern movement also birthed concrete poetry, where the positions of words and lines on the page have meanings of their own, relating to the denotation and connation of the words. Some of Mr. Patchen’s love poems work in this way, and more, since the poet is also an artist. Many of his poems are inked or painted in heavy black letters and lines. Some show creatures, birds, mythical or stylized animals or figures that represent humans as they accompany the poetry; supplementing explicating. Imagism is still another movement within modernism. If William Carlos William’s “The Red Wheelbarrow” is a classic example; Mr. Patchen’s “Plow Horses” is another. What does it mean to live now? Easily in the oil of their blood. Like Williams, Mr. Patchen emphasizes the simplicity of the image to explode in meaning. Further, Mr. Patchen’s poetry reads as if he finds word choice deep in his soul. Such depth makes the poetry tension in his oxymora and ironic connections nearly unbearable to the reader. Consider, “fragrant silence,” “wordless prayer,” (“Permanence”) or “bonfire of sound.” (“In Judgement of a Leaf”). Smile in a way that only women know. And are made more virginal. This edition of Awash with Roses has an interesting bonus for readers. The book starts with a biography of Mr. Patchen’s life, from childhood when he tore pieces of scrap paper up, scribbled on them, and pretended to read to his parents, through his meeting, courtship and marriage to Miriam, to his life of poverty, and his painful end. The brief biography, by Editor Larry Smith and his daughter, Laura, is well written and precise. The Patchens traveled widely in literary circles, and accounts of their relationships with many of the famous poets and writers of the era make very interesting reading. This material further enhances the poetry in Awash with Roses for readers. Lovers, regardless of gender identification or sexual preference, will delight in this book. Sally D. Ketchum is a teacher with national honors who also writes award-winning fiction and poetry for both children and adults. As a connoisseur of mysteries, Ms. Ketchum often uses the seminal devices of detective literature to teach writing in her classes.